As any fan knows, Prince kept his public image on lockdown. He didn’t let people cover his tracks on YouTube, and he didn’t post old videos all over random Tumblrs. Instead, he trusted his fans would want to buy his music—and they did, with more than 100 million records sold worldwide to date. There are a few exceptions to that rule—excellent performances and appearances by Prince over the course of his career—and some of those are making the rounds on social media in the wake of his death. Take, for instance, his rip-roaring Super Bowl halftime show in 2007. Backlit and facing down pouring rain and a wind machine, Prince delivered one of the all-time greatest Super Bowl halftime performances ever, and one that acts are forced to measure up against, even now. For a more in-depth look behind the scenes, the NFL has provided the following clip, which looks at how the whole show was put together, though it doesn’t provide nearly enough info as to how Prince kept from falling down while wearing those shoes on a slippery stage. More sentimental types might want to check out this clip, which has Prince, Tom Petty, Steve Winwood, and Jeff Lynne performing “While My Guitar Gently Weeps” at the 2004 Rock And Roll Hall Of Fame inductions. As far as Prince content goes, it really gets going at about 3:30, when he starts the song’s big solo, turning into something even Petty and George Harrison’s son Dhani seem impressed by around 4:40. 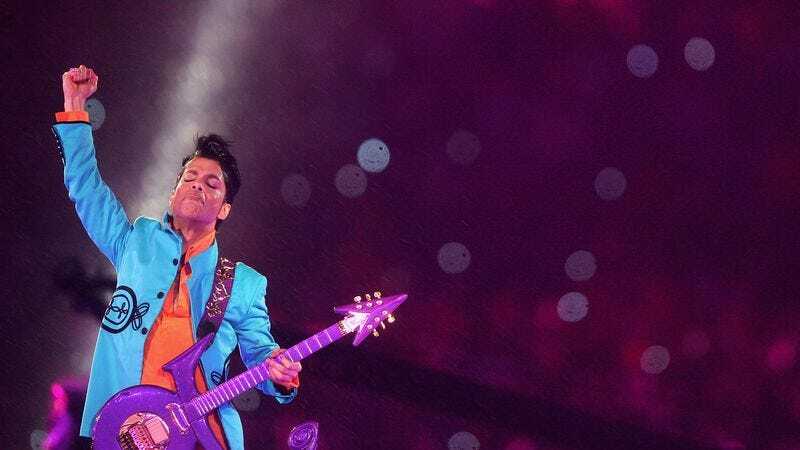 More recently, Prince brought the house down on a 2014 episode of Saturday Night Live, when he performed an eight-minute medley of a number of tracks off Plectrumelectrum and Art Official Age, rather than just the typical “here’s the single off my new record” rigmarole most artists go through. That’s not really available in embeddable format, but Deadspin has the whole thing uploaded into its video player . And, of course, there’s always this, the single greatest Prince story of all time, told via Chappelle’s Show. Prince doesn’t actually appear himself, but it’s too good not to mention. Other great clips are below and, please, post your favorites in the comments.